“There is a bodily location for worst kind of different Karmas like job Karma, business Karma, bad debts, relationship karma, and even poverty, extreme levels of poverty. Situations like you do everything in your capacity but nothing works. You are pushed to the edge. Dr. Pillai has revealed that the second chakra in the human-spiritual body, called the Svadhisthana chakra, holds your worst karma and special rituals for Muruga at the great power spot of Thiruchendur can remove the karmas that reside in this chakra. Under Dr. Pillai’s guidance, AstroVed is offering a unique one-year program of ongoing rituals for Muruga to deeply cleanse your karma and help free you from the negativity that is holding you back in life. This program helps you to connect with Muruga every week during his special power times to access his Divine powers to eradicate your worst karmas and receive his protective blessings. Enroll in AstroVed’s one-time FREE Archana service at Thiruchendur Muruga Powerspot by providing your name and Birth star. This a new technology recommended from Dr. Pillai to remove the worst karmas. Once you click the submit button, you will receive an email requesting permission to receive communication from us. Once, you confirm, you will receive the schedule of your one-time FREE Archana service. Mythologically, Thiruchendur is the place where Muruga killed the most powerful evil demon Soorapadman and his brothers Tarakasura and Simhamugan, rescuing the Devas (celestial beings) from his evil grip. At the end of the war, the demon Soorapadman, realizing his defeat, turned himself into a mango tree. Muruga used his Vel to split the tree into two halves, leading to Soorapadman pleading for mercy and asking for a boon to be with Muruga. Thus, one-half of the tree was transformed into a peacock (his vehicle) and the other half to a rooster (emblem in his flag). 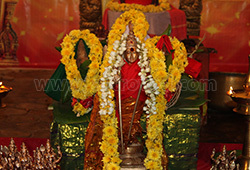 AstroVed will be performing, every Tuesday, Archana at Thiruchendur and sacred (homas) Fire Prayers for Kukuta (rooster) and Mayura (peacock) on Muruga’s power days throughout the year. Dr. Pillai has revealed that the second chakra in the human-spiritual body, called the Svadhisthana chakra, holds your worst karma and special rituals for Muruga at the great power spot of Thiruchendur can remove the karmas that reside in this chakra. 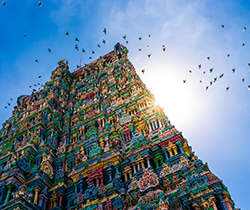 Participate in AstroVed’s Muruga deep-cleansing program of yearlong rituals to connect with Muruga on a weekly basis during his power times. 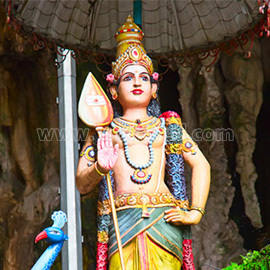 Invoke the divine blessings of lord Muruga to destroy your worst karma and negativities. 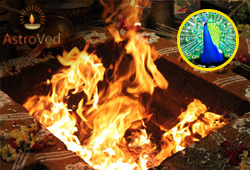 You will receive the sacred grey ash powder from the homa and kum-kum (Red Vermillion Powder), which will be blessed in the rituals. Keep this on your meditation altar and wear it on your forehead during meditation or at other times to expand the Divine blessings into your life. Please Note: The shipment of your Prasad starts from Chennai, Tamil Nadu a week after the entire set of rituals is performed. For international shipping, please allow 2 – 4 weeks for delivery. Our most sincere prayers are done on your behalf; however, we cannot guarantee results. Results are purely in the domain of God.